The term ‘aging’ tends to conjure up images of wrinkled skin with uneven pigmentation, but this doesn’t always have to be so. Starting at the end of puberty, the cell turnover process slows down, which means that dead skin cells remain on top of the skin, and new, healthy cells take longer to reach the surface and replace them. Taking proper care of your skin can help maintain a youthful complexion, and it is essential to begin a healthy skincare regimen early on so that your skin will look younger for longer. Here are some essential skincare tips to follow in your 20s and 30s to help achieve and maintain gorgeous skin. Wearing a broad-spectrum sunscreen with an SPF of at least 15 every day is the best way to protect the skin and prevent dark spots, visible blood vessels, wrinkles, and other signs of aging from developing. Broad-spectrum sunscreens protect you from harmful UVA and UVB rays, which can cause premature skin aging and skin cancers as well as suppress the immune system. Our broad-spectrum SkinPS antioxidant facial sunscreens are great for preventing future sun damage while also reversing existing damage starting in your 20s, and it is important to continue using sunscreen to protect your skin no matter what your age. Retinoids are vitamin A products that unclog pores, boost collagen production, and accelerate the cell turnover process. These products even out discoloration and improve fine lines and wrinkles to produce brighter and smoother skin. Retinoids are proven to prevent acne, which also prevents acne scarring that can appear as colored spots or indentations in the skin long after a blemish has healed. In addition, clinical studies show that retinoid products prevent wrinkles and even treat precancers and help prevent future skin cancers. People in their 20s should begin incorporating a retinoid in their skin care regimen and continue using it to maintain their skin’s health. Our Topical Tretinoin (Obagi) products are prescription forms of vitamin A that have superior anti-aging properties compared to over-the-counter retinol products and are the gold standard in topical treatment for radiant, youthful skin. Products that contain antioxidants, such as vitamins and polyphenols, help improve the color and texture of the skin by lightening hyperpigmentation and increasing collagen beneath the skin’s surface. They also protect your skin from future free radical damage. Check out our highly beneficial C Emollient Gel and CEGA Eye Cream to stimulate the production of your skin’s collagen and reveal a brighter, more even skin tone and texture. Moisturizing to hydrate your skin is almost as important as wearing sunscreen when it comes to preventing wrinkles. Moisturizers fight dryness, balance skin tone, and improve texture, and hydrated skin is able to retain its elasticity and ward off wrinkles and fine lines more easily. Our SkinPS Calming Cream provides enhanced moisturization with a lightweight, soothing feel to repair and soften the skin. Stay tuned for Part 2 of this blog on how to have gorgeous skin in your 40s and beyond. For more information on the products we offer to keep your skin healthy and vibrant, please visit our online skin care product store. You may also call us at (909) 981-8929 or fill out our online contact form to schedule your consultation with one of our board-certified dermatologists to learn about the ideal products or treatments for your individual skin type and condition. This entry was posted on Thursday, July 31st, 2014 at 11:01 pm	and is filed under Acne, Skin Care, Skin Conditions, Uncategorized. You can follow any responses to this entry through the RSS 2.0 feed. You can leave a response, or trackback from your own site. Chemical peels and laser skin resurfacing treatments both provide a refreshed appearance to the skin. They reduce fine lines, minimize scarring, and correct skin discoloration from sun damage. One treatment with either method can significantly improve skin texture and tone. Obviously, the main difference between the two is the technique, but there are a couple of other differences to consider before choosing the one that’s right for you. For laser skin resurfacing, Dr. Lee uses the “Mixto SX” Microfractional CO2 laser, which is one of the most advanced lasers available. The laser ablates the dermis to cause immediate contraction and skin tightening that will later encourage new collagen production. Over the next 6 to 12 weeks, the skin will continue to improve. Treatment takes 30 to 60 minutes depending on the size of the area. Recovery time is about 5 days indoors, after which you can apply makeup to cover any remaining redness. A chemical peel uses varying strengths of acid to remove the damaged layers of the skin. Our esthetician, Jackie Vandenlangenberg, performs three types of peels – light, moderate, and deep – that will all reveal the healthier skin beneath. • The Beta-Lift Chemical Peel is a light chemical peel that will treat acne and improve skin pigmentation. Consistent treatments are needed to maintain and improve the results. • The Vitalize Chemical Peel is a moderate chemical peel that is often used to improve skin discoloration and fine lines. Subsequent treatments will improve results. • Finally, the Jessner Chemical Peel is the deepest chemical peel that we offers. It provides dramatic results by improving or eliminating sun damage, fine lines, wrinkles, acne, acne scarring, dark spots, and melasma. Treatment takes about an hour, and recovery time will vary depending on the strength of your peel. Heavier peels will require several days out of the sun, while a light peel often requires no downtime. The cost for chemical peels ranges from $80 to $160 per treatment, depending on the strength of treatment. The cost of laser skin resurfacing runs $1,5000 to $3,000 for treatment of the whole face. Laser skin resurfacing is more advantageous than chemical peels when it comes to treatment flexibility. With the laser, Dr. Lee can ablate skin to a specific depth in one area and to a different depth in another area. The “fractional” part of its name means that the laser beam divides the treatment area into quadrants, or “fractions,” to allow the tissue to cool. This results in less pain during treatment and a quicker recovery than other types of laser treatments. During any type of chemical peel, different strengths of acid are not usually combined for different areas of the face, and the depth of the peel cannot be adjusted during treatment. Moderate and deep chemical peels will treat acne, but laser skin resurfacing will not. In fact, patients with active acne are not the best candidates for laser skin resurfacing. Those who are prone to cold sores will have to ask their doctor for an antivirus prescription before they undergo laser skin resurfacing. Patients who experience laser skin resurfacing or a deep chemical peel will get the most dramatic results and are typically very pleased with the outcome. Laser skin resurfacing has the added advantage of continual improvement for the next couple of months due to stimulated collagen production from the laser. Light and medium chemical peels also provide fantastic results but may require subsequent treatments to maintain or completely rid the skin of certain imperfections. If you are ready to rejuvenate your skin in the Upland area, please contact board certified dermatologist Dr. Sandra Lee. During your consultation, she will recommend the treatment option that can give you the smooth, younger-looking skin you desire. Call (909) 981-8929 today, or fill out our online contact form for more information. This entry was posted on Wednesday, June 11th, 2014 at 4:55 pm	and is filed under Uncategorized. You can follow any responses to this entry through the RSS 2.0 feed. You can leave a response, or trackback from your own site. « A Glass of Wine a Day to Keep the Doctor Away? Join Us at The Envy Party! 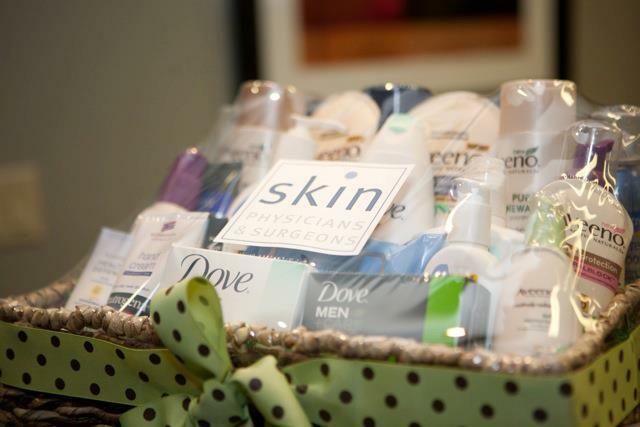 On Thursday, October 10th, 2013, Skin Physicians & Surgeons will be hosting our annual patient appreciation event: The Envy Party! It will be held from 4pm until 7pm at our office, located at 859 E. Foothill Boulevard in Upland. Come join us for an evening of food, entertainment, treats, and discounts as we show our gratitude to our patients and the community. If you’re tired of looking tired and want to reverse the signs of aging, October 10th is the time to learn about treatment options and take advantage of all our amazing offers. Our doctors, physician assistant, and esthetician will be performing cosmetic demonstrations and explaining more about the details of each product. The rooms inside our office building will be featuring information on different treatments so our guests can gain all of the knowledge necessary to decide the right option for their needs. We are having more specials than ever before at this year’s event, with discounts up to double what we offered in previous years. To LIKE us on Facebook and check out all of our beauty specials, click here. Don’t make your friends envy you, bring them along! It’s definitely true that more is merrier because our patients who bring a non-patient friend receive a $50 gift card just for RSVPing and signing in with them. Patients can bring up to 2 friends and earn up to $100 in gift cards! You and your friends are sure to have a fabulous time at The Envy Party as we celebrate YOU, our amazing patients. To be eligible for these great deals and gifts, an RSVP is a MUST. Please visit envyparty2013.eventbrite.com/ or call our office at (909) 981-8929 to let us know you’re coming. Even if you can’t make it to the event on October 10th, feel free to stop by our office during the week of October 7th through 11th to take advantage of all these fantastic discounts. We look forward to seeing you soon! This entry was posted on Friday, September 20th, 2013 at 8:26 pm	and is filed under Botox/Dysport, Cosmetic Procedures, Cosmetic Surgery, Fillers, Laser Treatment, Skin Care, Skin Conditions, Uncategorized. You can follow any responses to this entry through the RSS 2.0 feed. You can leave a response, or trackback from your own site. « Frownies: The At-Home Botox Alternative? Six year old Alexa was suddenly afflicted with a life-threatening condition called dermatomyositis, which causes distinctive skin rashes and acute muscle weakness. She got so weak that she was unable to walk. There is no cure for this disease, but presently it is under control with medications. This brave little girl is our guest of honor at our annual patient appreciation event, The Envy Party, September 27th 2012. We hope you have a chance to meet her that night. 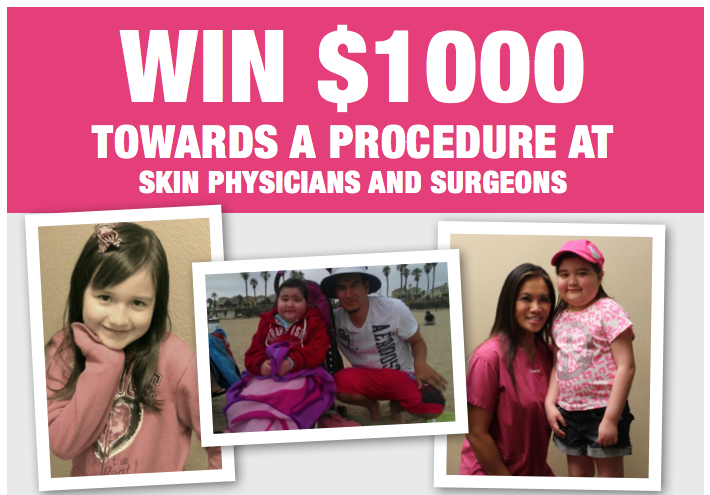 Purchase a $20 ticket for an opportunity to spin our prize wheel and a chance to win $1000 towards a procedure here at Skin Physicians and Surgeons. 100% of proceeds will go to support Alexa’s medical costs. You can purchase an opportunity to spin the prize wheel at The Envy Party or just stop by our office any time to spin the wheel before the event. This entry was posted on Friday, August 17th, 2012 at 9:53 am	and is filed under Botox/Dysport, Cosmetic Procedures, Cosmetic Surgery, Fillers, Laser Treatment, Office Life, Uncategorized. You can follow any responses to this entry through the RSS 2.0 feed. You can leave a response, or trackback from your own site.